Similar entreaties were sounded by new US Secretary of State John Kerry, who exhorted the international community, and particularly European states, to take immediate action against Hezbollah. “We need to send an unequivocal message to this terrorist group that it can no longer engage in despicable actions with impunity,” he said. John Brennan, President Barack Obama’s counterterrorism top adviser, likewise called on the EU to take “proactive action to uncover Hezbollah’s infrastructure and disrupt the group’s financing schemes and operational networks in order to prevent future attacks.” Blacklisting Hezbollah would empower the EU to freeze the organization’s assets in Europe. Europe remains impervious to Hezbollah’s exceptionally bloody record and ongoing war crimes. The mounting and very tangible evidence of critical Hezbollah complicity in the mass murder of Syrian civilians has not dented the EU’s disinclination to include the group on its list of terrorist organizations. Israel has frequently asked the EU to label Hezbollah as terrorist, yet these requests fall on deaf ears. To be sure, there are nuances in the overall European evasiveness. The Netherlands had designated Hezbollah a terrorist organization five years ago. But the official EU stance remains intractable. It is not that the EU’s most stubborn holdouts – Germany and France – do not know the facts about Hezbollah. It is just that they will not let facts interfere with their opinions. There can be no more smug obfuscation of the picture – Hezbollah is not just a major force in Lebanon but a potent ideological/religious mercenary whose fighters, among other assignments, play a key role in attempts to strengthen Assad’s grip on power, rain terror on Syria’s populace and, if given a chance, grab control of the weapons of mass destruction in Syrian stockpiles. Yet back in EU headquarters, Hezbollah is confoundingly still regarded as separate entity from its “military wing.” It is categorized as a social movement, part of Lebanon’s legitimate civic and political structure, rather than the Iranian backed terrorism exporter that it is. Europe appears insistent on seeing only Hezbollah’s charitable front, though such fraudulent facades are part and parcel of the modus operandi of most terrorist outfits, a fact which should not surprise or have escaped the attention of Europe’s movers and shakers. It gets even stranger. While official Europe strains itself to hinder trade with Iran and punish given upper-echelon Syrians, it allows Hezbollah to raise funds quite boldly within the EU. Hezbollah boasts many adherents among Europe’s burgeoning Muslim communities, most notably in Germany. Hezbollah emissaries visit their European adjuncts (often also sleeper cells) and openly solicit contributions there. The cover story – in keeping with the EU’s formal perception of the organization – is that the money is earmarked for social-welfare and educational projects in Lebanon. Intelligence organizations worldwide agree, however, that money from Europe help to plug shortfalls and to bankroll terrorist operations. By no means is this an inconsistency that exclusively affects Israel. Europe permits a dormant terrorist potential to thrive in its midst and it knows so, its denials notwithstanding. 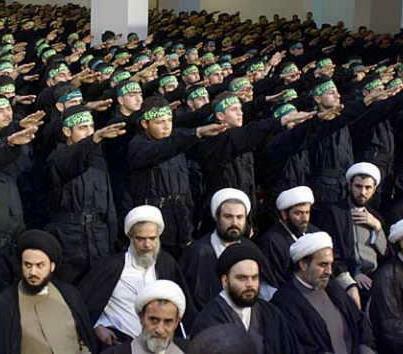 What a nice pic…the Hezbollah Nazis saluting to their “Führer”…! The EU MORONS are supporting those cold blooded killers, as long as they believe that the Jews are their selected targets…Jewish blood is cheap for the EU gangsters (I always thought, that Hitler and his followers had lost WW II.) and as long as they are assured by Hizbollah, that they only try to follow in Hitlers footsteps, then ALL WILL BE JUST FINE !!!!!!! A few or a lot of dead Jews mean ***NOTHING*** to madame Ashton and >>>>>GERMANY<<<<< and France and England…and so on. A bunch of terrorists who are only trying to kill Jews are JUST FINE with the EU. “… Sylke Tempel, editor of the German magazine Internationale Politik, put it pithily when he told the New York Times this week: ‘There’s the overall fear if we’re too noisy about this, [the group] might strike again, and it might not be Israeli tourists this time. '” (David Hornik, http://frontpagemag.com/2013/davidhornik/europe-staging-ground-for-anti-israeli-terror/ — while it should be noted that Sylke Tempel is biologically a she, not a he). In the meantime, there has been another (attempted) attack on the Jewish school in Toulouse. There still seems to be no police protection around that school. Jews are serving as lightning rods, while the “Auschwitz option” is kept on the table by shielding Iran from countermeasures through eternal dialogue offers. Indeed, nothing that new; only the tasks have been redistributed. The EU sympathy for the Hezbollah killers really shows the TRUE colours of Europe ! I want to hear the “trolls” equivilence this! The secret, hidden meaning revealed by the International Holocaust Memorial Day cartoon of Netanyahu is that Jewish blood, murderous Jew-hatred, is the old reliable all-purpose super-glue that holds the European Union together. Bless you Sarah for your intellectual insights and ‘education’ to those of us who are ardent readers of your columns! Oh! How relative it is that ALL Jewish Brethren should support the state of Israel! The ‘clouds of the 1930s and 40s’ are darkening the skys of Europe ‘all over again. Yes, the cancer of anti semitism was only ‘in somewhat of a notable remission’ for a few decades, but recently has morphed its rampant metastases almost on a world wide basis,.with ‘overt public support’. The EU, the UK have succumbed to ‘their conquerors, the Islamists’. (the rampant and vocal source of Jew hatred’). Their significant countries are on their ‘last remaining breaths’. As the numbers of Islamists grow within the countries of their ‘targets’ (including the USA) they will find ‘willing PC’ to ‘invite them and their Sharia laws’ with full appeasment to their wishes…. Major trouble then ensues, and how sad! One difference between ‘then’ and ‘now’…..the state of Israel has ‘arisen’ to become a ‘Haven for the Jews’. Its ;strength and accomplishments are almost unbelievable!.. ‘NOW, JEWS ARE WELCOMED TO ISRAEL as the most important ‘option’ for ‘safety and freedom’ from those who would gleefully ‘repeat the Holocaust’ of WW2. I ‘preach’ to my children that they should ‘preach to their children (my grandchildren) that the support of Israel as a nation MUST be of ‘foremost priority’, and option, for their future safety! American Jews allegiance to the USA, of course, is a ‘co-priority’ because we are blessed to be citizens of a country that has ‘been a saviour’ to the world as the ‘strongest police force for freedom’ that can combat the ‘evil’ that is forever internationally present. The EU and UK are prime examples of ‘the blood of American lives that were given’ in support of ‘saving their lives and land’! I wonder how really grateful they are? That was their political downfall. The philosophical downfall occurred because the printing press was not then in wide use, and the masses of pagans were vulnerable to Christian conversion (often at swordpoint). This gave Europeans a cultural identify that was vague, so could be twisted to bad purposes; and suppressed native European culture that was based on paleo-humanism. Not until Gutenberg’s printing press emerged, did native European culture re-emerge, but still tainted by mysticism. This contradiction at the heart of European culture has destroyed both Christianity and humanism, leaving nihilistic secularism to create a cultural vacuum (which Islam is filling).